I have been on Active Duty for 17 years and I recently returned from another deployment just in time to see the birth of my second child. 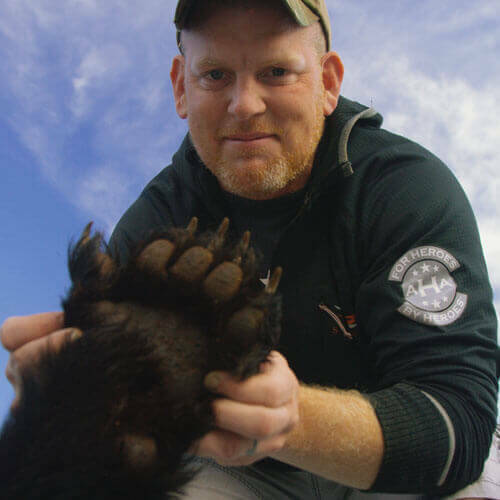 As my wife and I were figuring out life with our son and the addition of our daughter I received a phone call from Troy Givens, the President and Founder of American Hero Adventures and he informed me that I had been selected for a black bear/wolf hunt in southeast Alaska. I was beyond excited to be able to return to Alaska after nearly 12 years away from such a truly astounding place with hunting and fishing unlike anywhere else I have ever been. From this moment all the way to after my return, Troy kept in touch with me working out every single detail and answering every question I had. The only thing he couldn’t do for me was make the days until the hunt pass by faster. From start to finish, everything about the hunt was remarkable. The guide service, Alaska Coastal Outfitters, were remarkable and made the trip top notch. Aside from my family waiting for me, I don’t think I considered returning to the “real world” throughout our entire trip. After numerous encounters and stalking several shooter class boars, my guide and I sealed the deal on the last night with about two hours remaining taking a beautiful mature 6’7” boar. The best part wasn’t the harvest because we could have tagged out on any day of the trip, it was the fact that this trip was a reset for me; a chance to slow down, relax and just reconnect with what I have missed doing over the last few years. I can’t thank American Hero Adventures and Alaska Coastal Outfitters enough for the unparalleled experience they gave me; the hide, skull and phenomenal photos will always be a constant reminder of such a great organization and the incredible opportunity they provided me. Thank you, Troy!